At some time in their lives most pets have to undergo anaesthesia. This may be when they are young and healthy (e.g. for neutering) or when they are older (e.g. for dental work or tumour removal). Whilst anaesthesia is a serious procedure and does carry some risk, it is not as worrying as many people think. In our practice we use the most up-to-date anaesthetic agents for all our patients, not just the elderly or sick. Although these are relatively expensive, we believe the improved safety aspect and smoother post-operative recovery more than justify the extra cost. Your pet will usually be admitted around 8 a.m. You will be asked to sign a consent form both for the anaesthesia and any surgical or other procedures. Well-lit consulting room fully equipped for thorough examination of your pets. Once your pet’s heart, pulse, temperature and respiration have been checked, a sedative will be given which will help him/her relax and will make administration of the anaesthetic easier and less stressful. Once your pet is sufficiently relaxed, he/she will be given the injectable anaesthetic which will make him/her unconscious. A tube will then be passed down his/her trachea (windpipe) and connected to the anaesthetic machine. This delivers a mixture of gases (isoflurane, oxygen and nitrous oxide) which keep him/her asleep during the procedure. 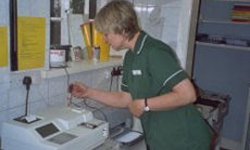 The theatre nurse will constantly monitor his/her heart and respiratory rate and the depth of anaesthesia and machine called a pulse oximeter will be used to monitor heart rate and oxygen levels. When the procedure is complete and any antibiotic and painkilling injections have been given, the isoflurane and nitrous oxide will be turned off. Oxygen is given for a further 5 minutes by which time your pet will have regained consciousness. 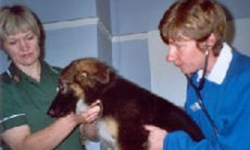 He/she will be confused and uncoordinated for a while so he/she is kept warm and quiet in a comfortable kennel. When you come to collect your pet (usually between 4 and 5 p.m.) he/she will be fully awake and pleased to see you. You will be given a list of instructions for post-operative care and a special bland diet. We like to check our patients 24-48 hours after anaesthesia and surgery to ensure that there are no problems and that they are well on the road to recovery. Any sutures are removed about 10 days after the operation by which time most animals are completely back to normal. 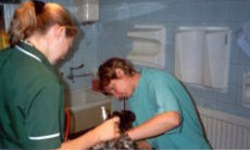 Need a vet in Formby?